One of a pair of 7200s sold to Patrick Racing, this car was raced by Gordy Johncock during the 1973 season. Finished in STP colours, it was entered in the Indy 500 which Johncock won outright. It was later damaged at Pocono and the repaired car was shortly thereafter sold to Lee Brayton. 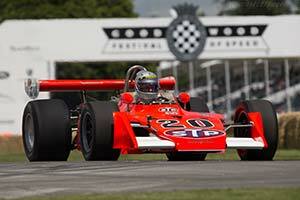 He raced the car late in 1973 and again in 1974 until Brayton crashed the car at Indy. Very heavily damaged, it was finally restored for Brayton to its Indy 500 winning configuration until the late 2000s. It was shown briefly at the Indianapolis Motor Speedway Museum before being acquired by the current owner in 2012. He brought the car to the 2014 Goodwood Festival of Speed before entrusting it to the Indy museum for display once more.